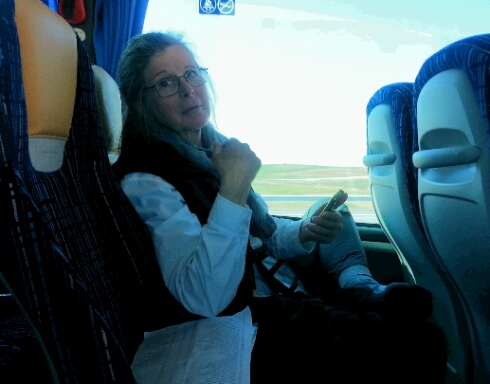 MB is sadly following the Via de la Plata track on her phone and looking out the bus window. She wanted to get out and walk, but I assured her that more suitable terrain awaits us. The bus ride is actually quite interesting. We’ve passed fields and fields, rolling hills, and a few towns. 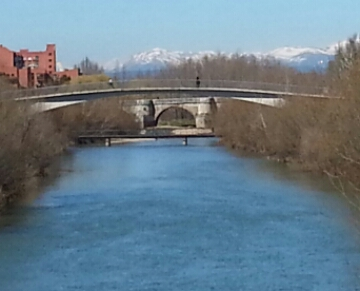 Off the bus and walking into the city, you can see mountains with snow on the top. That’s the direction we’ll be walking. March 16, 2016 in Camino 2016, Camino de Santiago. ← 9. Change to Plan B.